Oxford was truly an Open day. The students seemed really excited and very happy to be at Oxford. Our undergraduate open days for 2015 are now over. 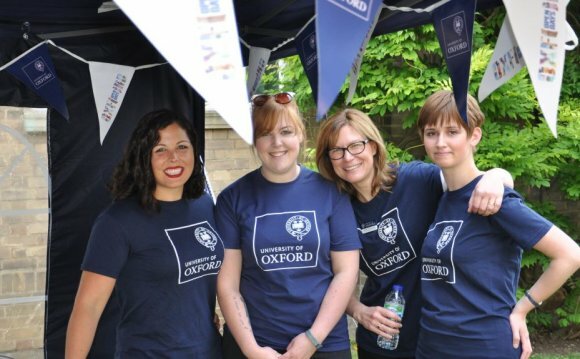 Next year's open days will be on Wednesday 29 June, Thursday 30 June and Friday 16 September. A full programme of events will be run by departments and colleges. We will also welcome visitors to an Open Day Information Centre at the Examination Schools in the High Street, which will be open 09:00-17:00. You do not need to register for our open days. A few events, such as some of those with tutors may require advance booking. You can view a sample open day programme here, and use this to plan your day. Please note that very busy events may only have places available for students, not for parents or companions as well. Parents and others who are unable to attend events in colleges and departments are always welcome to visit the Open Day Information Centre where will be information desks all day, as well as talks in the afternoon. It is easy to feel that there is just too much to do and see at our open days. In our experience people who plan their day in advance often feel they have made the most of their visit. Most visitors spend at least a full day in Oxford, arriving before 10am and leaving after 4pm. If you would like to stay overnight, some colleges offer accommodation for those travelling significant distances. This must be booked directly with colleges. There is no central campus at Oxford University so in order to visit one or more colleges and visit a department during the day you will need to travel around Oxford city. However, most open day locations are within easy walking distance of each other. No open day location is further than a 15 minute walk from Broad Street. If you would rather not walk or would like to move around more quickly you might like to hire a bicycle for the day. The Oxford City Guide tells you where to hire bikes and how much this will cost as well as providing other useful information about getting around the city. Our open day guide includes a map and there will be staff volunteers (in blue T-shirts) available around the city centre and in the Open Day Information Centre to help you find your way. Anyone with a mobility impairment may borrow a free self propelled, or battery operated wheelchair or scooter to travel around Oxford city centre via Oxford Shopmobility. This scheme is run by Oxford City Council and available 08:00 - 18:00 Monday to Friday, and 09:30 - 17:00 on Saturdays and Sundays . To book your wheelchair or scooter call 37 at least one day in advance. Oxford Shopmobility is based in the open air section of Oxpens car park. To access this, you are advised to approach the city either on the A420 (Botley Road), into Oxpens Road, and enter the car park at the entrance near to the Ice Rink or enter the city on the A4144 (Abingdon Road), turn left into Thames Street and continue until you reach the car park on the Oxpens Road next to the Ice Rink. For more advice arranging your visit, please contact colleges or departments directly or email or call +44 (0) 1865 28800. Our Disability Advisory Service will also be happy to discuss support available both in advance and during your visit. For more advice on disabled parking facilities please see our travel advice.